Send us a message to let us know your families experiences with pollution and toxins. Write a letter to your local paper. Contact us for sample letters. Ask your legislators to pass HB 5653 to protect children from toxic chemicals. See what National Clean Water Action is up to. Pre-written, factual tweets to share with your twitter followers. 1) Select the #safehealthyct tweet (from below) you’d like to share. 2) Copy and paste the tweet into your Twitter client. 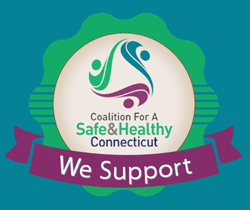 Be sure the tag #safehealthyct, isn’t cut off from the tweet. 3) Share as many or as few of the facts as you’d like, with as many followers as you’d like. 4) Encourage your followers to participate too by asking them for RT’s (re-tweets). The more people we can reach, the better! Display our badge on your website! Simply right click on the badge, save it to your computer, upload it to your website and link the photo back to us. Easy as that!